جلالی, نرگس, صاحب الزمانی, منصور, اسلامی شهر بابکی, مهین. (1394). تأثیر 8 هفته برنامه ی ورزش درمانی بر تعادل ایستا و پویای کودکان دارای اختلال نقص توجه / بیش فعالی (ADHA). 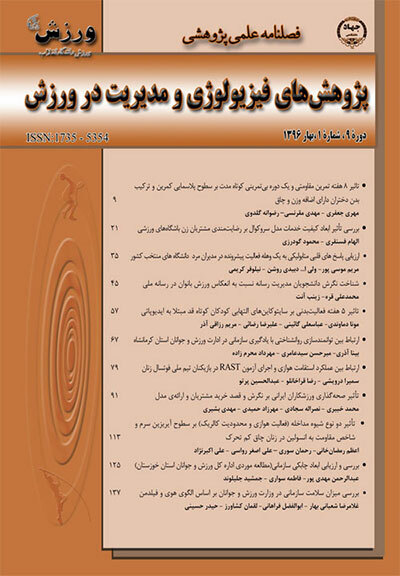 پژوهش های فیزیولوژی و مدیریت در ورزش, 7(1), 125-134. نرگس جلالی; منصور صاحب الزمانی; مهین اسلامی شهر بابکی. "تأثیر 8 هفته برنامه ی ورزش درمانی بر تعادل ایستا و پویای کودکان دارای اختلال نقص توجه / بیش فعالی (ADHA)". پژوهش های فیزیولوژی و مدیریت در ورزش, 7, 1, 1394, 125-134. جلالی, نرگس, صاحب الزمانی, منصور, اسلامی شهر بابکی, مهین. (1394). 'تأثیر 8 هفته برنامه ی ورزش درمانی بر تعادل ایستا و پویای کودکان دارای اختلال نقص توجه / بیش فعالی (ADHA)', پژوهش های فیزیولوژی و مدیریت در ورزش, 7(1), pp. 125-134. جلالی, نرگس, صاحب الزمانی, منصور, اسلامی شهر بابکی, مهین. تأثیر 8 هفته برنامه ی ورزش درمانی بر تعادل ایستا و پویای کودکان دارای اختلال نقص توجه / بیش فعالی (ADHA). پژوهش های فیزیولوژی و مدیریت در ورزش, 1394; 7(1): 125-134. هدف از پژوهش حاضر بررسی اثر 8 هفته برنامه­ی ورزش درمانی بر تعادل ایستا و پویای کودکان دارای اختلال نقص توجه/ بیش فعالی(ADHD) بود. 30 نفر از کودکان بیش فعال با (میانگین سن 1/1 ±07/8)، (میانگین وزن5/7 ±6/25) و (میانگین قد 1/11 ±126) به صورت داوطلبانه و با کسب اجازه از والدین در این پژوهش شرکت کردند و به طور تصادفی به دو گروه کنترل و تجربی تقسیم شدند. قبل از شروع تمرینات تعادل ایستا و پویا با استفاده از دستگاه تعادل سنج بایودکس اندازه گیری شد. گروه تجربی به انجام یک دوره هشت هفته ای (سه جلسه در هفته) ورزش و تمرینات تعادلی پرداختند. در این مدت، گروه کنترل هیچ گونه تمرین تعادلی را تجربه نکردند. پس از پایان تمرینات، تعادل ایستا و پویا مورد ارزیابی قرار گرفت. تجزیه تحلیل داده ها با استفاده از آزمون tمستقل و زوجی صورت گرفت. یافته های تحقیق نشان داد که تعادل ایستا و پویا در گروه تجربی در هر سه شاخص کلی، قدامی- خلفی و داخلی­-خارجی قبل و بعد از تمرینات در گروه تجربی و نیز در مقایسه با گروه کنترل اختلاف معنی داری داشتند (05/0p<).نتایج تحقیق حاضر نشان داد که تمرینات تعادلی و ورزش می­تواند در بهبود تعادل ایستا و پویا کودکان بیش فعال نقش بسزایی داشته باشد. The aim of this study was to examine the effect of 8 weeks of exercise therapy program on static and dynamic balance in attention deficit / hyperactivity disorder (ADHD) children. 30 ADHD children (mean age 8.07±1.1 yr, weight 25.6±7.5 kg and height 126±11.1 cm) voluntarily participated in the study with their parents' consent and were divided into control and experimental groups randomly. Before exercises, the Biodex Balance System (BBS) was used to measure static and dynamic balance. The experimental group performed 8 weeks (three sessions per week) of balance exercise while control group did not perform any balance exercises during this period. After the program, static and dynamic balance was evaluated. Data were analyzed by independent and paired t tests. The results showed that in the experimental group, static and dynamic balance were significantly different in all three indexes of general, anterior-posterior and interior-exterior before and after the exercises. These findings were also significantly different in the control group. The results showed that balance training and exercises can play a significant role in improving static and dynamic balance of ADHD children. 1- ابراهیمی، اسماعیل. صلواتی، مهیار. معروفی، نادر. اسماعیلی، وحید. (1385). بررسی تأثیر تمرینات تعادلی بر آزمون های تعادلی و محدوده ثباتی پویا در مردان سالم با استفاده از سیستم تعادلی پویا، فصلنامه توانبخشی، دوره هفتم، شماره دوم، 25-19. 2- صادقی، حیدر. نوروزی، حمیدرضا. کریمی اصل، اکرم. منتظر، محمدرضا. (1388). تأثیر شش هفته برنامه تمرین عملکردی بر تعادل ایستا و پویای مردان سالمند سالم. مجله سالمندی ایران، سال سوم، شماره هشتم ،571-566 . 3- فاوست آنجلا، رادنیکلسون. (2009). احمد رمضانی واسوکلایی،مروریبرنقشمخچهدرنارساخوانی، پژوهش در حیطه کودکان استثنایی، سال نهم، شماره سوم، 272-255. 4-کوثری، سعید. کیهانی، فاطمه. حمایت طلب، رسول. عرب عامری، الهه. (1391). بررسی تاثیر یک برنامه فعالیت بدنی منتخب بر رشد مهارت های حرکتی کودکان مبتلا به اختلال نارسایی توجه/ بیش فعالی ((ADHD و کودکان اوتیسم ((HFA. رشد و یادگیری حرکتی-ورزشی. شماره دهم، 60-45. 5- Aydog E. Aydog ST. Cakci A. Doral MN. (2006). “Dynamic postural stability in Blind Athletes Using the Biodex Stability System”. In sport Med. 27(5), pp:415-418. 6- Brian, D.K. (2009). “Sport participation and anxiety in children with ADHD”. Journal of Attention Disorders. (12)6, pp:499-506. 7-Carpes, F., Reinehr, F., Mota, C. (2008). “Effects of a program for trunk strength and stability on pain, low back and pelvis kinematics and body balance: A pilot study”. Journal of Bodywork and Movement Therapies, 12(1) ,pp: 22-30. 8-Cug, M. (2012). “Effects of swiss ball training on knee joint reposition sense core strength and dynamic balance in sedentary collegiate students”. PhD Dissertation, Department of Physical Education and Sport, Middle East Technical University. pp:3- 50. 9- Effgen, s.k. (1981). “Effect of an exercise program on the static balance of deaf children”. Physical Theraphy, 61(6), pp:873-7. 10-Faries, M., Greenwood, M. (2007). “Core Training: Stabilizing the Confusion”. strength and conditioning journal. 29(2), pp:10-25. 11- Frandin, K., Sonn, U., Svantesson, U. ( 1995). “Fanctional balance tests in 76-years-old in relation to performance, activities of daily living and platform test”. J Rehab Med. 27(1) , pp:231-241. 12-Gusi, N., Adsuar, J., Corzo, H., Pozo-cruz, B., olivares, P., & Parrac a, J. (2012). “Balance training reduces fear of falling and improves dynamic balance and isometric strength in institutionalized older people:a randomized trial”. Journal of physiotherapy, 58(2), pp:97-104. 14-Sadock, B.J., Sadock, V.A., Ruiz, p. (2009). “Kaplan & Sadock’s comprehensive text 9th Textbook of Psychiatry”. Lippicot Williams & willkines, Philadelphia. pp:3560-3564. 15-Shorer, z., Becker, B., jacobi, B., polishook, T., oddsson, L., Melzer, I. (2012). “Postural. control among children with and without attention deficit hyperactivity disorder in single and dual conditions”. DOI 10.1007/s00431-012-1695-7. 16. vardiskoni, AF, vasokelayi, AR. ( 2009). “A review of the role of the cerebellum in dyslexia”. Except Children; 9(3): pp:255-72. 17- Verret, C., Guay, M., Berthiaume, C., Gardiner, P., Béliveau, L. (2012). “A Physical Activity Program Improves Behavior and Cognitive Functions in Children With ADHD : an exploratory study”. Journal of Attention Disorders, 16(1), pp:71 -80. 18-Willardson, J. (2007). “Core Stability Training: Applications to sports conditioning programs”. Journal of Strength and Conditioning Research, 21 (3), pp:979-985. 19-Wolraich, M.L., Baumgaertel, A. (1996). “The prevalence of attention deficit hyperactivity disorder based on the new DSM-IV criteria”. Peabody Journal of Educatio, 71(4), pp:168-186. 20- Zang, Y., Bomei, G. u., Qian, Q., Wang. Y. (2002). “Objective Measurement of the Balance Dysfunction in Attention Deficit Hyperactivity Disorder Children”. Institute of Mental Health, Peking University, Journal of Clinical Rehabilitation, 6(9), pp:1372-1374.